The Nigerian youth marched out to our legislative houses all around the country on Thursday the 26th of September 2013. The occupation of elected political office had long shifted from the call to service to what was self-serving interests exemplified by outrageous remunerations that make the eyes water. It is the long held belief that our democracy is both profligate and extravagant, it is safe to assume that the cost is unsustainable. Without considering inflationary changes and reassessments up to 2013, this alone presents an interesting reading on the percentages scale. 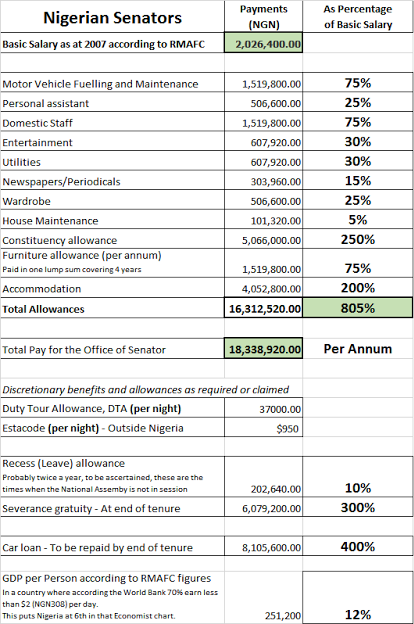 A senator will take 735% in allowances beyond his basic salary monthly with 200% going to housing and 250% going to managing a constituency office. If the Pay As You Earn (PAYE) deductions total more than the basic salary, you then wonder if the allowances are taxed too. Besides this, the vehicle loan is 400% of annual basic salary, but if a term is 4 years, how does a senator pay off that loan without seeking extra funds over and above the salary? It would mean the legislator will would have either to meet that from the allowance pool or engage in other business activity to meet possible shortfalls, this remuneration structure is uneconomical and presents the framework for nefarious activity, possibly corruption. What does not show in this salary payslip is the furniture allowance, which is 75% of annual salary paid in a lump sum at the commencement of legislative tenure and 5% for housing allowance. We still need to get a current figure representing what we pay our legislators but in percentage terms with reference to the basic salary, it is unlikely as I have said before that any private sector job rewards people this well, this democracy at this rate and cost is unsustainable. The greatest danger in having a torrent of opinions is it begins to erode the banks of moderation and flood the plains with controversy. I posted the above tweet yesterday as I tried to contain my anger in dismay of some views expressed on Twitter. There is nothing wrong with having opinions on many topics, in some cases, that person might well be a polymath, and we need the engagement of such brains on the diversity of issues that crowd the Nigerian discourse on Twitter. Where I have issues is when opinions consistently offered unchallenged become a burdensome and unconscious form of hubris breeding intellectual arrogance causing disabling ignorance as Peter Drucker the legendary management consultant once said. Sadly, when people occupy the opinion space so commandingly, we lose the input of the less articulate, but more knowledgeable leaving all of us the poorer for it at first and then allowing for the propagation of error and falsehoods that seriously needs debunking. Even I have been reticent to enter into some scraps because it can both be laborious and energy-sapping, besides it descending into a shouting match, though I do my best to avoid that and settle for agreeing to disagree, moving on soon after that. My tweet used the analogy of a torrent as in that of fast-moving body of water, possibly a river, and the banks being the ability to allow in interaction and discourse with the plains being the wider audience that might read the stuff, flawed as it might be. We all in terms of what we know, what we embrace, what we tolerate and how our patience is exercised, have a solemn duty of sorts to call out those who with their views upset the community of fellowship and the equanimity we espouse. The simple advice I find myself wanting to give is, if you are prone to the verbal diarrhoea, find a private convenience with a huge water closet to do your thing, and when you leave, a finger depressing the air freshener for a minute would give others the opportunity to use the facility soon after you. I could almost feel envious of those who have been able to make a living out of the narrative. The narrative being the stories of their lives, their experiences from childhood to the present, bringing recognition and resonance to audiences who can both identify and commiserate. In fact, I believe we do not all tell our stories enough for too many reasons to mention as we adjudge what we might have been through to be too mundane, lacking in drama and having nothing exotic. The amazing thing is, the bleeding obvious when repackaged and rephrased, given context and purpose can so easily be profound. I find myself writing this from the perspective of two sets of stories that need telling, the first I read yesterday of men holding up placards, not in protest or as part of a demonstration, but just a statement, one that went from what they heard to what they experienced – abuse. I added two memories of mine to the mix with the following tweets. "Put it here, you will like it." She was 14, I was 7. "If you love me, you will do it, I love you very much." I was 10, he was 28. We must blow the lid off the secrecy, stigma and shame of child sexual abuse. The second story came from relationships we have with our parents concerning our upbringing initially and then the sharing of the secrets of our lives, many of which following the context of my last few blogs are difficult for our parents to understand. Many of us still harbour too many secrets and are yet to come into the fullness of who we really are to those closest to us by blood – some wait for the release that might come when our forebears have passed on – in all, there is loss and there is regret, fulfilment and closure are not that easy to obtain. Here in The Power of Storytelling on the OutTales Around the Fire blog that I follow, I could really identify with the three elements of ‘Killing My Mother’ that the author, Ade Adeniji narrated. I am sure many Nigerians can relate to this - The Father+Mother Project - Storytelling Performance takes place on the 5th and 6th of October, 2013. I dare say, in the process of understanding our lives, probably too many of us are still in the blame and despair stage and the journey to forgiveness and hope is like one of a thousand miles through dreadful places the boldest angels will fear to tread. If anything, we must embark on that journey, if we are to find healing and a new fullness of life. It dawned on me this morning how far I had come from the Tuesday week four years ago, when I was admitted to hospital with a life-threatening condition. By the time we discovered what it really was, I had the difference of between 5 weeks to live or survival, which involved intensive chemotherapy and a very long period of recuperation. However, I must not deceive myself that four years on, with the ravages of disease come serious life-changing circumstances, some so radical as to fill you with hope-destroying desperation, despair and depression. Having life is not enough, there has to be quality and purpose to it, yet, one must be thankful and grateful for the gift of life and the opportunities it presents, to have hope and to be encouraged to continue the tough journey that lays ahead. Yes, it dawned on me, when I realised I could not help someone I would have had no problem helping only 5 years ago. With means, opportunity, ideas and insight, I had the capacity and the ability to spare nothing to set things in place and sort things out – Alas! I was no position to do so apart from find the crutch of my recurring sob story to lean on. With the encounters of a harder life I have recently experienced in the last few years, I pick myself up and as many times as I find that I fall into exhaustion, relapse and tiredness as if one is losing the will to live after all that I have been through. Whereas, all I need is a light, someone willing to take a chance, open to the risk of engaging a person with much to offer even if the first point of interaction does not create an amazing impact. You stand at the cliff-edge wondering whether the myth of flight can be a reality or a walk back to face what presently gives no joy is a better prospect. You ask yourself again, where would this long scary story end? Thought Picnic: Are those blanks signs of depression? A few Sundays ago, I was in church and whilst I appeared to go with the flow, when it came to the sermon, I did not get anything of what the pastor had to say. In the multitude of words, I comprehended nothing, besides the fact that he was speaking English – my thinking could not connect with what he had to say. Somewhere along the line, he did ask if we were getting something out of what he had to say, I probably was in a minority not knowing his preaching style to be sure of how it worked for others. It reminded me of a number of episodes in my academic life when I appeared to be present in class but not present in mind or objective. There was one instance where I do remember drawing a complete blank. On reflection, I was going through some sort of crisis but there was no one I could talk to about what my experiences were to be sure if I could get help. My parents would never have understood it, my father being a brain-box just would not have appreciated that I was attending class and not getting it, he would have had me off to vocational classes with the usual excoriating remark redolent of my slow development and my slow responses probably connected to my premature birth – who can say? My mother would have had me visiting prophets, seers and marabouts trying to ward off evil, real or imagined, besides drinking copious amounts of holy water, some so rancid that it sickened to the pit of my stomach. This rotten mental block persisted for about 3 years, and eventually lost me 5 years of tertiary education after secondary school. I would have tortuously recited an interminable number of times Psalms in Yoruba over bowls, buckets or cups of water – it made life less than fun to live in every dimension possible. I am yet to understand what I really went through; depression comes to mind, something we Nigerians have yet not begun to understand in the slightest. Yet, we are under constant pressure of competition and comparison, expected to perform because every other encumbrance has been removed as tuition, board, sustenance, provision and many other parental responsibilities that have been equated to love meeting emotional need. It was a dark time of my life and in all; it took the best part of 10 years to realign my course not having understood but taking religion and kept a stoicism about things that they will all turn out right. These cycles of darkness and light have come and gone through what has become my story. At times, I am so sure of what I need to do and at other times even what I am sure of doing does not seem to produce the results that once came without much exertion. I have a constant process of assessment and re-evaluation going on, hoping a Eureka moment will dawn on me and with that, the answers to the puzzles of frustration I have long endured. Thankfully, this Sunday, what the man spoke about was very clear, easy to understand and useful – I need to renew my thinking again. Then you think you believe, but what you do is feed your doubts. I could remember the day I had a deep biopsy almost 4 years ago when the consultant dermatologist asked one of his understudies to probe the fungating cancer tumours in the ball of my foot and the second toe of my left foot. The pain was already unbearable and otherworldly as the woman flooded my foot with injections of Lidocaine to no effect. After seven shots, I could still feel the raw pain of cancer, excruciating beyond what words could describe, but the biopsy had to be done. So I laid on the gurney, a nurse holding one hand as if I was enacting a sketch of a woman in labour, she asked me to take deep breaths, though I did not have to push, I did ask for an epidural but none was offered. In the end, I had some tissue folded into a big pad and put that between my jaws for the firmest bite force I could muster and gave in to the worst of the biopsy, which ended after 10 minutes. I was in pain for another hour after that, it was one of the worst experiences I ever had in my life, but it was necessary to ascertain the type of cancer I had for them to determine the course of treatment. Today, I was to have another experience that could easily have been happening to the other gender as I wondered aloud if it would be healthy and speculated about its gender, then remembered we do not gestate. Before I knew it, someone was congratulating my wife and I; that left me in a rather tight corner before I stuttered my thanks and moved on swiftly ere I had to divulge too much about my warped thinking and complicated relationship arrangements or the lack of them. I was to have an ultrasound liver scan, and I really was not expecting a foetus to be kicking and grimacing in my belly. Preparations for that meant drinking lots of water to have a full bladder and no food for at least 6 hours before the scan. I find water tasteless that I only got half of the two litres I was supposed to drink into my system. I registered, and within minutes, the sonographer called my name, took me into a consulting room and then asked me to take my shirt off, sag my trousers before lying on the bed. She applied some jelly to my belly and used the probe to rub it all over the exposed parts of my abdomen before I had to take a series of long deep breaths that I held for almost a minute before I was allowed to breathe normally again. I could not see the scans as they allow women to see the ultrasound scans of their life foetuses, however, we did come up with the idea of projecting the scans onto the ceiling to keep patients entertained but that might not be possible under the NHS. Turning onto my side, my arms raised above my head, she did more scans until she declared that my liver looks fine. Over time, I will continue to have blood tests and possible biannual scans – great relief and thankfulness, one cannot afford another major event for this day. I have to admit I have a problem too many ideas course through my active mind and with that the desire to tap at my keyboard and produce a blog. I have been doing this for a long time; I am in my tenth year of blogging. When I first started blogging, I passed my copy through a grammar and writing style checker to ascertain the readability of what I have written and found that it consistently registered too high on the scale for it to cater to a broad reading audience. The grammar checker became a moderating influence as I tried to make my thoughts easier to access and thus easier to read. Shorter paragraphs, shorter sentences, and sentences I could read back to myself without pausing to understand why I wrote that way, captioning and much else came into my writing. Still, I end up doing a poor job of it; the ideas are generally sound but riddled with errors. These errors are rarely of the spelling kind but of the grammatical context, writing style and readability kind. The strange thing is I have not been able to bring the kind of rigour I give to business writing to blogging as if it is a mind-set thing and hence my problem compounded. I find safety and refuge in my blog, I am able to constantly review, edit, correct, rephrase, and refine what I have written without the need for an intermediary, because it is my space. I carry my shame constantly reminded that though my mother tongue is English and I pride myself in the ability to express myself excellently, I am still a very bad writer. What I have noticed with my writing is that the flow of inspiration is quite different from context of review. Somehow, I have found that if I lose the first draft of anything I have written I am usually unable to recreate that flow of inspiration again. I do feel that loss deeply and that is why I prefer to create my blogs on an offline editor, because each time I have done it on an online editor, I have lost everything. This happened only a few days ago – I have not been able to reproduce that inspirational burst since then. I say to people, when I have my fingers to the keyboard, I am like a man possessed; my fingers trying to keep up with the torrent of phraseology churning in my mind, much of which is fully formed in my mind but my fingers rarely keeping up with it. My senses then fail to spot what I have left out; between what I was thinking and what I eventually wrote; my sight deceived into thinking they are the same. At one time, I took to reading my draft blogs out to myself as an editing process; I still do that for my most important pieces. Nevertheless, I am quite impatient because my newly crafted blog feels like bread just taken out of the oven, the aroma, the warmth, the softness and everything that makes freshly baked bread enraptures you, you want some of it, there and then. Therefore, you finish the blog, give it a scant review, annotate it, caption it, format it and publish it, satisfied that the job is done. Hours, days, weeks, months or even years later, you go back to read that blog and palm to face embarrassment – Did I really write that? In the heat of the moment, I did, but because it is my blog, I can review, edit, correct, update and constantly do that for the lifetime of the blog – a blog is never finished – it is a living document and that is because, I am really a bad writer. I enabled the grammar and style checker for this blog, but it was not used for this section of the blog. Between the first attempt at writing this blog, and what you can read now, I improved on the readability but lost some of the literary and artistic license I take in how I write. I guess that is what really makes me a bad writer. The Readability Statistics after 20 minutes of editing the first draft. I think there is much room for improvement.